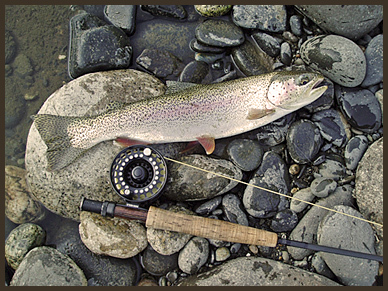 Most anglers traveling to Lake Creek, Alaska in the month of June come for the world famous king salmon fishing, but don’t forget about the river’s super healthy population of native rainbow trout. The majority of Lake Creek rainbows are meat eaters, and the five species of salmon that call Lake Creek their home each summer provide ample food for the resident rainbow trout. You are currently browsing the Sky's Guide – Pacific Northwest & Oregon Guided Fishing Trips | Salmon Fishing, Steelhead Fishing, & Sturgeon Fishing blog archives for June, 2009.